Spend a night in Texas as DPAC welcomes back Willie Nelson! 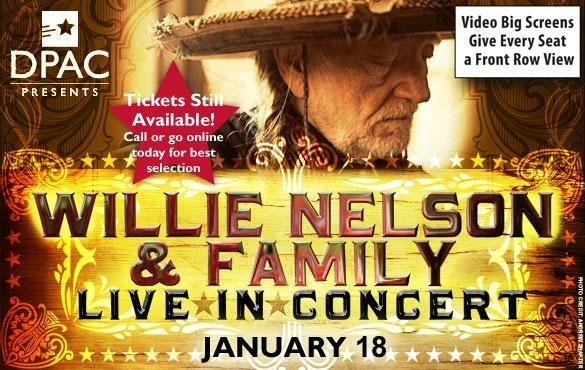 American musical institution Willie Nelson and Family returns on January 18 with special guest Lukas Nelson, Willie’s son. 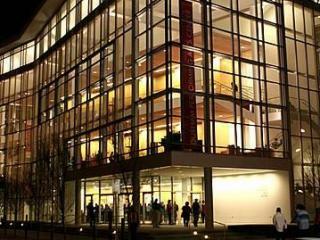 This will mark Willie’s third performance at DPAC, his first two being sell-outs. Willie Nelson is one of the greatest artists of our time, a songwriter and performer whose legacy will endure for generations to come. He has worn many hats besides those of a musician; he co-founded Farm Aid in 1985 to give assistance to farmers facing financial woes; Willie has written seven books; he’s acted in such hit movies as Electric Horseman, Honeysuckle Rose and Blonde Ambition. In his long career, Willie has amassed prestigious honors including induction into the Country Music Hall of Fame, Kennedy Center Honors and National Agricultural Hall of Fame. On his latest project, a new memoir entitled Roll Me Up and Smoke Me When I Die, Willie Nelson muses about his greatest influences and the things that are most important to him, and celebrates the family, friends, and colleagues who have blessed his remarkable journey. This entry was posted on Thursday, January 10th, 2013 at 5:23 am and is filed under Shows. You can follow any responses to this entry through the RSS 2.0 feed. You can leave a response, or trackback from your own site.